There has been a lot of praise for ME AND EARL AND THE DYING GIRL, but I think a lot of it is misplaced. I think that this would make a great movie, but as for the book, I have mixed feelings. First, the humor. I do have to admit that overall, ME AND EARL AND THE DYING GIRL has some real gems, and many of those gems come from the humor. For those of you who are wondering, when I say humor I mean teenage boy life humor. All of the ironic, laugh-or-cry? moments mixed in with how-did-my-life-get-to-this moments mesh together to create some undeniably funny and embarrassing scenes. However, the moments were the humor falls through are where things become wearing. There were a lot of times where I wanted to stop reading because this story wants to make you feel something, and that’s where this book fails. There was no place where I could lost in the story, when I truly related to what was going on, and the writing felt forced. Second, the characters, which leads off from my forced-writing viewpoint. 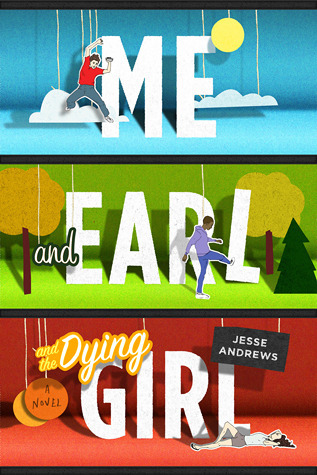 Details in ME AND EARL AND THE DYING GIRL are added as an afterthought. Earl is portrayed as an extremely stereotyped character, with little to no depth. Greg is a “pudding” type character: the awkward kid who socially doesn’t really work, but still manages to grab your heart. These characters have worked before. You know them. DIARY OF A WIMPY KID. SIX IMPOSSIBLE THINGS. THE PERKS OF BEING A WALLFLOWER. PAPER TOWNS. If you’re not usually into novels, think Scott Pilgrim. Except those kids have the capacity to be sweet, to be more than just their awkward, don’t-fit-right selves. Throughout this book, I felt like Greg was constantly throwing himself a pity party and trying to cope with himself instead of actually living. Sure, THE FAULT IN OUR STARS is flowery. I would be the first person to say that it is. However, if TFIOS is flowery, then METDG is crude. All in all, I coudn’t relate to this book. There were moments when I did, but overall, METDG just wasn’t there. I can see the appeal behind this book. For some people, this book will work. If you really thought that TFIOS was just too much for you, then you should go this direction. There are similar themes but very different writing styles. While I have my biases, I do believe that there are plenty of people who will love this book. I can’t wait to see how the movie turns out. 1.5 stars. Press Play by Eric Devine Cover Reveal!